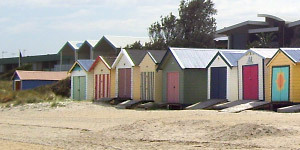 The Kingston Boatshed Association (KBA) is an Association of owners of boatsheds and bathing boxes within the City of Kingston, in Victoria, Australia. These fascinating, colourful wooden buildings can be seen on numerous beaches all around Port Phillip and are historic icons from Victoria's past that have been preserved for current and future generations to enjoy. This website contains information about these structures as well as information and news about the KBA and its members. Several photo sessions along the foreshore from Aspendale through to Bonbeach have culminated in the completion of the boatshed gallery. This now comprises 84 photos showing all of Kingston's 190 boatsheds. The KBA website has finally been launched to the public following the private preview at the AGM almost a month ago. The folks at ventraip.com (our web hosts) gave great assistance with the domain name registrations. Thanks, ventraip! From these humble beginnings, I look forward to gradually building on and expanding the website to fit the needs of the Association. At the AGM held on 10-Oct-2017, the KBA website was previewed by attending KBA members. It was very well received, with some members even making worthwhile suggestions. On a personal note, it was a pleasure for me and my partner, Inge, to both be invited for the website's preview. Despite not being members of the KBA, our long association with boatsheds meant that both of us found aspects of the meeting very interesting.